10 winners will be drawn out each month and they will win a $100 Tassie Devil Prize Pack. 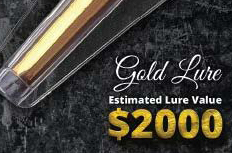 The 10 monthly winners will go into the final draw to win the 24 Carat Gold Tassie Devil Lure. 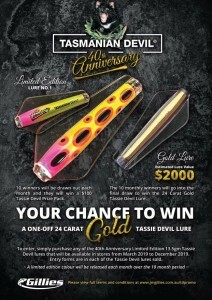 To enter, simply purchase any of the 40th Anniversary Limited Edition 13.5gm Tassie Devil lures that will be available in stores from March 2019 to December 2019. Entry forms are in each of the Tassie Devil lures sold.